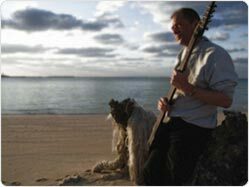 I'm a British Chapman Stick player living in Kyushu, Japan. I began playing Stick in November 1991 after watching it demonstrated by Jim Lampi in London. I had been interested in the instrument since the early 1980's having heard it on King Crimson and Peter Gabriel recordings and having seen a brief clip on TV of Tony Levin playing it solo. The experience of watching Jim Lampi play it close up was an unforgettable one, similar to watching someone do something that appeared to defy the laws of physics... I still remember how I thought at the time, "But he shouldn't be able to do that ... "
I've played in a variety of situations and countries over the years and I'm always looking for new opportunities to play my music, show people the instrument and let them try it out for themselves if they want. If you haven't yet seen or heard the Chapman Stick, click here (http://www.stick.com) to go to the Stick Enterprises website where there are demonstration videos, articles and information, details of the different instrument models available and how to get them, links to other artists' websites world-wide and a whole lot more. "Interesting new music by Derek now ... He has once again "morphed" his musical style and upgraded his Stick technique. The focus is now on his original compositions and pendulum like polyrhythms - always an uplifting sensation." The following are Federally registered trademarks of Stick Enterprises, Inc.: Stick, The Stick, The Chapman Stick, Grand Stick, Stick Bass, Grid, and Touchboard. 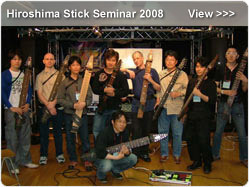 Japanese trademark registrations include: Stick and The Chapman Stick. Also, distinctive shapes and designs of The Stick fretboard tapping instrument are symbols of identification and exclusive trademarks of Stick Enterprises.